Russian President Vladimir Putin grabbed America's attention with his New York Times op-ed arguing against military intervention in Syria, particularly with the final paragraph where he disputes American exceptionalism. 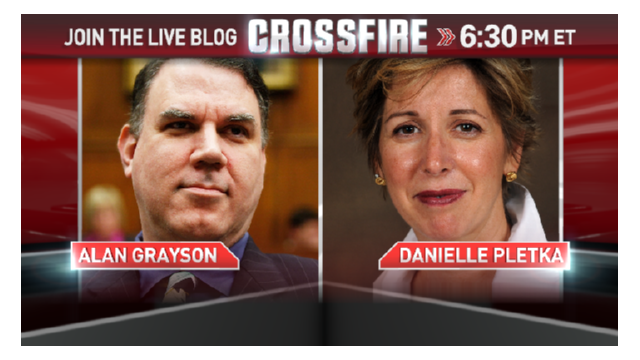 U.S. Rep. Alan Grayson (D-FL) and Danielle Pletka of the American Enterprise Institute join hosts Newt Gingrich and Van Jones in the Crossfire tonight to debate Putin's Syria plan and his take on the United States. We want you to weigh in: Is America the most exceptional nation? Vote below or tweet your response using #CrossfireReturns. You can also vote by commenting on our Facebook post. regarding "American Exceptionalism": If 'exceptionalism' means opportunity to succeed, generosity, civil freedoms, etc. then America is surely exceptional. If it is to mean the self assigned license to drop bombs on a country because we don't like what they're doing to their own people, then we should not be 'exceptional'. No country should have the right to attack another country unless it is itself under attack. Just because we think we are right does not give us license to become vigilantes and take international laws into our own hands. "The Earth is but one country and Mankind its citizens." We cannot be allowed to enforce just the international laws we want and ignore others. The US needs to become a world citizen and obey the international laws. That will make us 'exceptional'.